Firearms came into being about 900 CE. The first firearm was a Chinese fire lance, which was a bamboo tube attached to a spear. The weapon used gunpowder to launch a rock and a small burst of flame. The Chinese attached a spear to the first models because they were all but impractical on their own. They couldn’t get an accurate shot from more than a few feet away, so you had to be in close quarters for it to be useful. With the help of human ingenuity the fire lance evolved over time, leading to the modern weapons of today and the futuristic weapons of tomorrow. On the subject of futuristic guns, there are quite a few out there, and so many of them are fascinating. We’ll talk more about some of them in the paragraphs below. The first entry on our list is not one gun, but a series of guns. An Israeli army officer designed the cornershot gun, and American money made them a reality. What makes cornershot guns so unique and futuristic is that a hinge-like device has been built into it. There is also a side display from a video camera. These systems work in tandem so the gun barrel can bend and aim around corners without affecting the shooter’s ability to see. It’s like a fiberscope, but for military purposes. 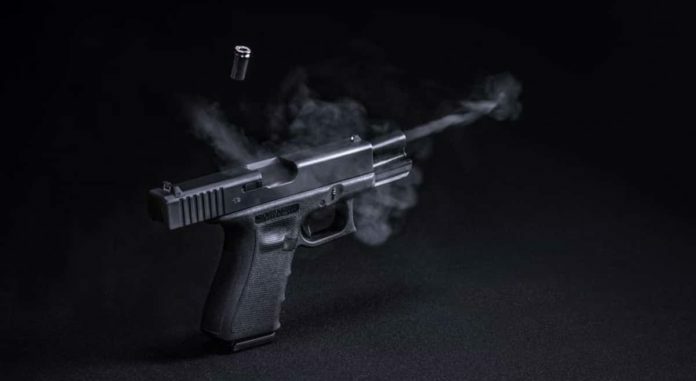 This new type of gun could even save lives since the soldier would no longer have to expose themselves to fire during combat. Various special forces groups in Asia and the Middle East use this gun already. The Armatix iP1 may be one of the safest, most secure weapons to ever exist. The reason is that this little pistol comes with a wristwatch that it links up to. The pistol must be within 25 cm of the wristwatch or it won’t fire. This prevents misuse of the gun making it much more difficult for anyone other than the owner to use it. If security appeals to you, we can teach you how to send files without risking the information in them. Tracking Point is a company that uses tracking technology like the ones used in fighter jets, to calculate shots. This helps to cut down on the potential for human error. To date, their most noteworthy creation is the ShadowTrax8, a bolt-action hunting rifle. This is certainly not the end for them, though. We’re almost certain to see a lot more from Tracking Point as the technology improves. The PHASR Rifle looks like a guitar case, but it’s a very sophisticated non-lethal weapon. The purpose of the weapon is to cause temporary blindness to targets. This will make resistance almost impossible so that capture is easier. The space opera feel of this weapon is not helped by the fact that it functions by firing a laser at a target to blind them. The science behind this is that a certain type of laser can cause temporary blindness without doing any permanent damage. The reason you haven’t heard of people using laser weapons all that much is that most of them are illegal. The Geneva Convention condemns any weapons that cause permanent blindness. The PHASR is legal because none of the effects are permanent. It’s possible that the PHASR is just the beginning. Lasers offer a lot of promise for the future, including the possibility of a weapon that can switch from lethal to nonlethal settings. This gives soldiers a way to win an engagement without risking the enemy’s life or their own, which should greatly reduce combat deaths. This Italian sidearm may look like an ordinary pistol, but it’s got a special innovation that sets it apart. The Chiappa Rhino has fixed the recoil issue that handguns have had for centuries. Instead of the recoil pushing the gun up and back, the Rhino just pushes back against the arm. You may be wondering why. Why is it important to get rid of the upwards recoil? It turns out that getting rid of it increases accuracy. It’s not just accurate, it’s also light. Part of that is owing to the aluminum alloy that most of the weapon is made of. The best way to describe the Five-Seven is that it’s like a handgun on steroids. Many claim this gun is great at piercing through armor. Don’t bother looking for photo or video proof, though, because the gun was built to fire an SS190 Duty Round, a special type of ammunition that helps give the weapon its armor-piercing capabilities. You won’t find SS190s in any store, though, because they aren’t allowed to be sold to civilians. Only police officers and the military are ever supplied with SS190s. The next entry on our list of futuristic guns is the KRISS Vector Rifle. This weapon attempts to solve the same problem as the Chiappa Rhino, but on a larger scale. The KRISS Vector is a rifle and a submachine gun at that. While a handgun can lose accuracy to recoil if you’re firing fast enough, a submachine gun definitely will. The KRISS Vector Rifle compensates by redirecting some of the force that causes recoil downwards to minimize the effect. As an added benefit, this rifle can fold up for easier storage. One thing movies constantly get wrong about guns is that bullets don’t travel very well through water, at least most of them don’t. This problem occurred to Soviet special forces back in the 1960s, and by the early ’70s, they had a gun designed to fire underwater. The gun was a success, but it had one major problem–it was designed to fire underwater. Once on land, the gun wasn’t very effective. The Soviets weren’t alone, though. Other nations also threw their hats in the ring and tried to build an underwater gun. The most recent success in the Western World was the German HK P11, which the US soon started using. They developed this gun in the 1970s, so it’s possible something else has secretly replaced it. The Russians may have solved their problems at last with the ADS. It can switch from above to underwater with a quick swapping of ammo. The weapon comes with a grenade launcher attachment that wasn’t waterproof in previous versions but is with the current model. The XM25 CDTE is a grenade launcher that was designed to improve the accuracy of grenades. Ever since their inception grenades have been subject to human error. If it was thrown at the wrong time or at the wrong distance, it could prove pointless or even harm allies. The XM25 removes a lot of the guesswork. Instead of having to calculate distance yourself, the XM25 can be set to fire up to 10 feet further or nearer than the default. The default itself, however, is the gun’s most useful feature. The gun fires a tracked grenade that will detonate itself when it gets within a certain distance from the target. This weapon has been in action for almost a decade and first saw use in Afghanistan in 2010. Our next gun on the list may look like somebody tried to build a handgun from the remains of a Nintendo 64, but it offers quite a bit in terms of customization. Much of this strange gun’s appearance owes to its plastic and aluminum body. It was also built with some pieces, such as the ammunition clip, larger than in most guns of the same type. This adds to the infinite customization that the gun is built to allow for. The problem is that the makers focused too much on the gun’s appearance and customization. The gun doesn’t function well at all. It doesn’t fit well in the hand, can be very difficult to fire, and clearing jams requires the user to get their hands very close to the barrel. You’re better off avoiding this gun or using it as a wall hanging. If you want gun parts that are reliable, try the classics, like AR-15s. Some of the best are made by Ballistic Advantage. There are a lot of futuristic guns out there, and other weapons as well. We’ve listed only a few of them on this list. We didn’t have space for all of them and new ideas are being developed all the time. If you’re interested in learning more about the future of the weapons industry, we encourage you to do more research on your own. If you want to see the latest in technology news or just want some advice on tech, please visit our site. We can tell you how to make a phone battery last longer, because who doesn’t need that? ‘Piece’ is an External SIM Card Adapter For Smartphones which adds Extra SIM to Existing Smartphone. Droidmen delivers expert opinion,reviews and up-to-date news on key technology topics including software,gadgets,mobile apps,games,security,Android and iOS.